We bring the Zoo to you! Zoo staff and volunteers will share their excitement about the natural world with your community. 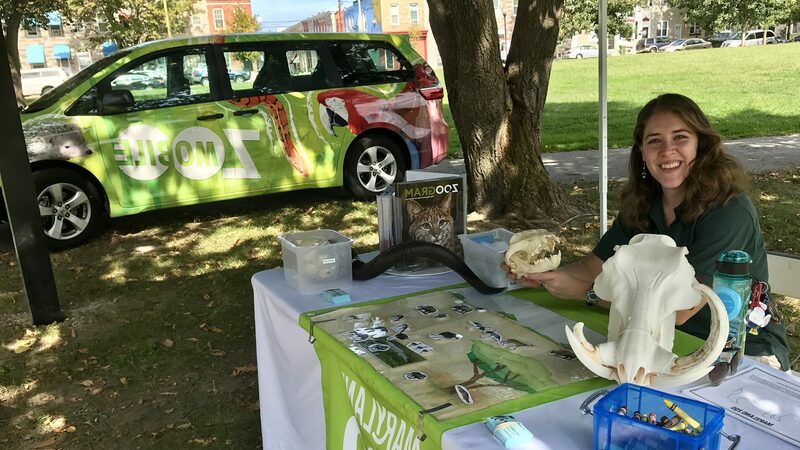 Bring the ZOOmobile to your community! Zoo educators will share their expertise and excitement about the natural world with kids and their families through fun and engaging table-top activities. Activities are provided free of charge. Travel fees may apply. If you are interested in adding an Animal Ambassador appearance to your event, charges may apply. Please note animal appearances cannot be guaranteed at any time. Kids will have a sensory-filled adventure and explore natural materials from our own backyard – Maryland! Activities will focus on Panamanian golden frogs, how the Zoo works to conserve this endangered species, and what Marylanders can do to help protect amphibians. Activities will focus on African penguins, how the Zoo works to conserve this endangered species, and what Marylanders can do to help! Zoo educators are excited to bring the wonder of the natural world to hospital patients and their families. During a hospital visit, a Zoo educator travels room to room while live video chatting with an educator at the Zoo. The educator at the Zoo will show patients and their families an Animal Ambassador through the live video feed. For more information about hospital outreach, please email outreach@marylandzoo.org.